Almost one year ago to the day, I found myself working among many upperclassmen within the admissions office. One of the students, Carla, was talking about how excited she was to head to Florida after winter break to complete an internship at Disney World. I instantly thought about how amazing it would be to work at the happiest place on Earth. 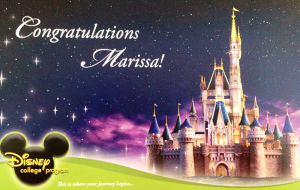 I started researching the Disney College Program whenever I had a free moment. While I was excited about the potential for me to become a part of this program, I was also hesitant about the prospect of moving to Florida for at least 4 months and more importantly, leaving my new home on Hawk Hill. At the beginning of this year, I was still researching the Disney College Program, but I often told myself that it wasn’t for me. In the beginning of October, something clicked in my brain: this program is a once in a lifetime opportunity! I then began the application process which includes an online application, a web-based interview, and if you’re lucky, a phone interview. Finally all the steps were complete and it was time to wait for the decision. I signed up to work one of the admissions events called the College Ready Workshop. As the people checking in dwindled down, I had time to check my email. There it was: an email from the recruiting office with the subject line of “Congratulations!” I began tearing up and went outside. I called my mom and when I came back inside I told some of my fellow Office Hawks the good news. They were so supportive and excited for me. I knew then that it would be okay to leave my second home to live out my dreams. My role (Disney’s term for job) will be in Quick Service Food & Beverage. As a Food Marketing major, I believe that the experiences I learn at Disney while combining customer service and food will be very helpful for future internships and jobs. Also, not many people can put Disney, a Fortune 100 company, on their resumé. The Leahy Advising Center was helpful in determining the best way for me to still be able to graduate on time after missing one semester. While at Disney, I will be working full time, but I am thrilled to be able to meet people from all over the world because I have loved doing the same at Saint Joseph’s. Also, as a student at a Jesuit university, service has become a big part of who I am. 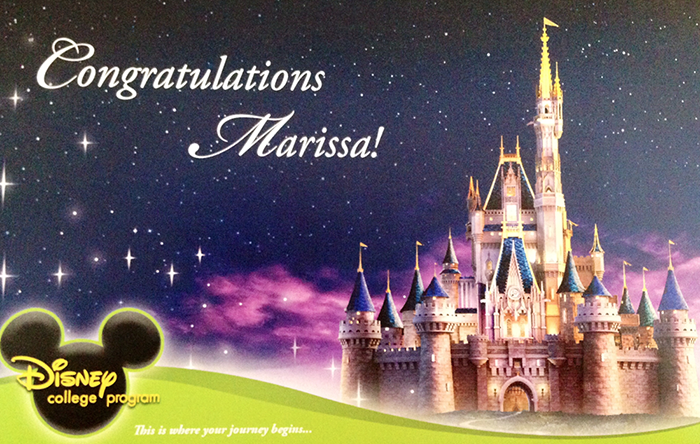 In Florida I will be able to continue this through Disney’s VoluntEARS program. The most exciting part of this process has been the overwhelming support from my friends and professors here at Saint Joseph’s. My professor from my freshman year seminar and service-learning class, Dr. Julie McDonald, emailed me and another sophomore, Ian, to congratulate us on our acceptance. Honestly, I have no idea how she found out, but the fact that she took time to email us and show her excitement was really touching. While I am going to miss SJU while I am gone, I know that when I come back, it will feel like I never left. Regardless of whether you want to the Disney College Program or do an internship ten minutes away from campus, the community here at Saint Joseph’s University will support you in any way possible. 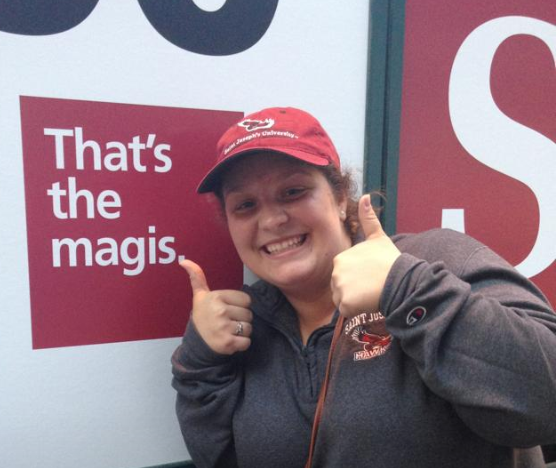 Marissa Walsh is a sophomore Food Marketing major from Chadds Ford, PA. She is a writer for Her Campus SJU, loves to take Service-Learning courses, and is an Office Hawk and Hawk Host for the Office of Undergraduate Admissions.